Since the beginning of Robert Morris men’s hockey, there has been one leader of this successful program. 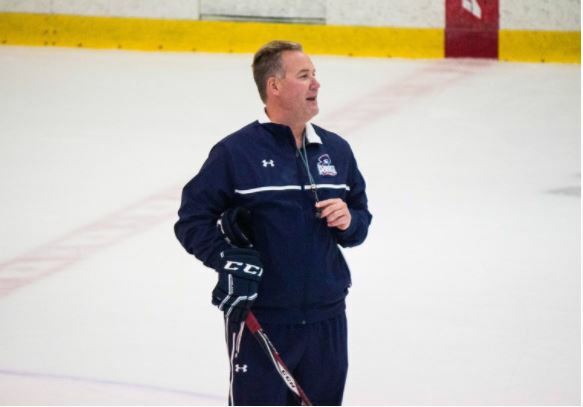 Head coach Derek Schooley has been at the helm since their inaugural season in 2004 after rumors had been circulating after the interest arose to buy the RMU Island Sports Center came to fruition. Schooley was an assistant coach at Cornell University in the 1997-98 season and an associate coach at Air Force Academy in the 2002-03 season. During his college career, he played for Western Michigan University as a defenseman. Schooley’s resumé made him more than qualified to be the first coach of a brand new NCAA men’s hockey program. In his third season as head coach of the infant program, he took RMU to the College Hockey America championship game but was defeated by Alabama-Huntsville. He took the Colonials to the championship again in the 2008-09 season and lost again, this time to Bemidji State. It would take Schooley five more seasons to return Robert Morris University to a championship game, this time in their new conference, the Atlantic Hockey Conference. The Colonials took the ice against Canisius and won their first program championship by a score of 7-4 during the 2013-14 season. This also gave them an NCAA Hockey tournament berth where they lost to Minnesota in the first round. Since then Schooley and his Colonials have been to three straight AHC championship games and have lost them all, including the last two against the Air Force Academy. Schooley has made appearances in five conference championship games during his tenure at Robert Morris University. He has only won one of those games resulting in one NCAA tournament appearance. The question now is if the blame is on the players, or if Schooley is unable to consistently create a championship caliber team. The past two seasons have been the hardest for the Colonials and their fans. They have faced the same team, Air Force, in back to back years and were not able to crack the code in either appearance to bring the title back to Moon Township. In last year’s performance in the AHC championship game, the Colonials fell to the Falcons 2-1. The Falcons had 14 shots on goal, against RMU freshman goaltender Francis Marotte, this being the lowest amount of shots allowed in a game in program history. The Colonials’ offense was able to double the effort of the Falcons and put 25 pucks on goaltender Shane Starrett, with each squad only taking two penalties a piece and not allowing one another to capitalize on the man advantage. In this loss, RMU’s offense did not produce like it did all season with it’s only goal coming from Ben Robillard, a senior that only scored 12 goals in his entire career in a Colonial jersey. Robert Morris had the best scoring line in college hockey with Brady Ferguson, Alex Tonge and Daniel Leavens, yet they were unable to score more than one goal in the championship. This season also ended in heartbreak for the Colonials. They traveled to Rochester, NY again this season for revenge against Air Force and were unable to close the season out like they have wanted to for the past two seasons. Just as they had the year before, they only tallied one goal. The Falcons scored five times and registered just four fewer shots than the Colonials. But the defensive side of the ice looked a bit different than the 2017 championship game. The defense fell short of limiting Air Force’s time on the attack and keeping the puck away from Marotte. There are two ways to think about the Robert Morris men’s hockey situation. The first is if Robert Morris is afraid of the unknown when it comes to coaching. Schooley isn’t the only coach at the school that has possibly been kept around too long. Schooley has been to five championships in his 14 years at Robert Morris University; only able to win one. This leads to the other discussion of coaches being fired for not doing enough but seemingly doing more than Schooley. Just this year University of Virginia’s men’s basketball head coach Tony Bennett took the team to the NCAA Tournament as a No. 1 seed in the south region. Virginia was upset in the first round by the University of Maryland Baltimore County, the first No.16 seed to ever defeat a top-seeded team. There was talk circulating about firing him even though he made it to the NCAA Tournament. Schooley has had plenty of success as the head coach of the Colonials, but he has also only been able to finish the job one time out of his five appearances in championships. Is it time for Robert Morris to move on from Schooley and chase those championships that have eluded them or just keep hoping that Schooley will get the Colonials over the hump?